Some people grow pumpkins to eat, others want a pumpkin to carve and then there are those who grow pumpkins as sport, striving for the largest pumpkin they can grow. The term ‘pumpkin’ can be confusing, meaning different things in different places. Here I am referring to the round or oval, orange fruits that are a member of the squash family. They are best known as Halloween decorations and holiday pies, but there is a lot more variety to pumpkins than just the common orange Jack-o-lantern. 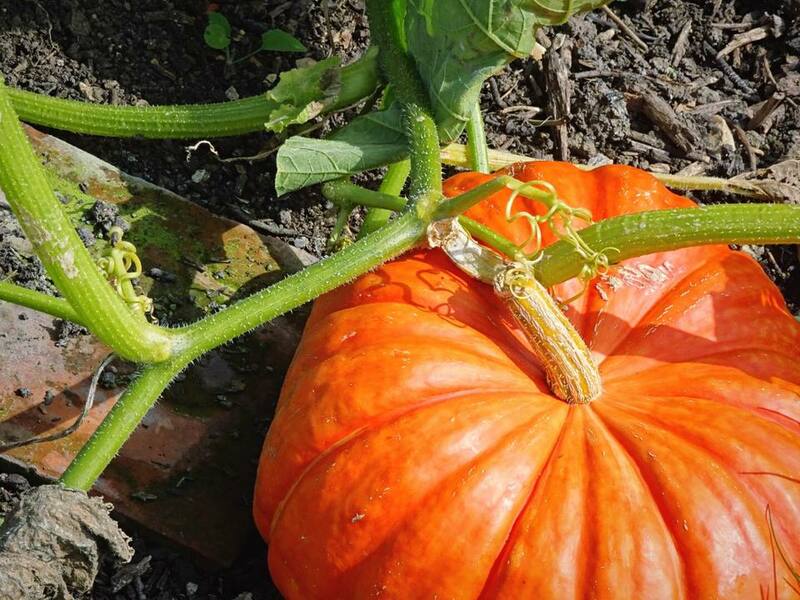 Pumpkins seem as American as apple pie, but they've been grown around the world for centuries. Orange is the most commonly know color, but pumpkins come in white, red, pink and blue and can be smooth, bumpy, oval, flattened or round. Pumpkins are a type of winter squash, but some are simply grown as decoration. The variety grown by most commercially is "Connecticut Field". These are usually between 10 and 20 pounds each and orange in color. Watery, with a bland taste, "Connecticut Field" is not a great pie pumpkin, but it makes a great Jack-o-lantern. Pumpkins are annuals, so hardiness zones do not apply, although most need a long season to mature. The pumpkins themselves will vary greatly from miniatures of a few ounces ("Jack Be Little") to giants ("Atlantic Giant") weighing in at over 1,000 pounds. Even the length of the vines will be variable, although most can grow more than 10 ft. in any direction. Either give your pumpkin vines plenty of space to spread out or grow them vertically, on a strong support. Pumpkins and all squash need full sun and lots of warm days, to produce and mature their fruits. Pumpkins are long season growers. Most need somewhere between 90 - 110 days. If you live in a short season climate, make sure you choose a variety that will have time to mature in your garden. Don't rush harvesting or your pumpkins won't last long or taste great. Wait until the color is uniform and the shell doesn’t dent when pressed with a fingernail. At this point, the vines should have begun to dry and shrivel. Watch for when the tendril closest to the pumpkin turns brown. That's the peak time to harvest. Pumpkins can withstand a light frost but always harvest before a hard frost. Cut them off the vines with a pruner, leaving 2 - 4 inches of stem. This is not a handle! It's there to help the pumpkin cure and to keep a disease from entering where the stem joins the pumpkin. Try not to break it off. Carving Pumpkins: "Connecticut Field", "Ghost Rider" or (yes) "Jack O" Lantern". Cooking Pumpkins: "Small Sugar", aka "New England Pie". Heirloom "Cinderella" Pumpkin: "Rouge vif D"Etampes", "Musque de Provence"
White Pumpkins: "Baby Boo", "Lumina", "Casper"
Hull-less Seed Varieties: "Hungarian Mammoth", "Lady Godiva", "Triple-Treat"
Pumpkin plants take up a lot of space. You’ll need a 6 x 8-foot area for 1 plant. Pumpkins will grow up a fence or trellis, but make sure it is strong and study since there can be as many as 9 pumpkins per vine. The vines of small pumpkins can sprawl as far as large pumpkins. Pumpkins like full sun and a rich, well-draining soil. Soil ph should be slightly acidic, 6.0 to 6.5. You can start seeds indoors about three weeks before the last expected frost. If your growing season is long enough, sow seeds directly in the garden when the soil temperature reaches about 60 degrees F. Plant 3 - 6 seeds in a hill, or slightly raised mound. Spacing varies with the variety (check the seed packet), but in general, allow at least 5 feet between plants in each direction. Vines and roots can easily spread 15 ft. Thin the seedlings to the strongest 2 -3 plants. Mulch around the plants to conserve moisture, suppress weeds and keep the fruit clean. It also helps to place boards or old roof tiles under the fruits, to keep them from touching the ground and rotting. Give your plants at least 1 to 2 inches of water a week, especially when they're blooming and setting fruit. Once the first fruits appear, you can pinch back the vine tips, to limit vine growth and to put the plant’s energy into maturing the existing pumpkins. However, this may limit production of more fruits. Turn the pumpkins slightly every week or so, to keep them growing symmetrical. Do this gently. You don’t want to snap the vines. Squash bugs and cucumber beetles. Avoid planting near a close a relative, like cucumbers or other types of squash. Companion planters can try planting petunias or nasturtiums nearby to repel the squash bugs and circling each hill at planting with radishes, to ward off squash beetles.